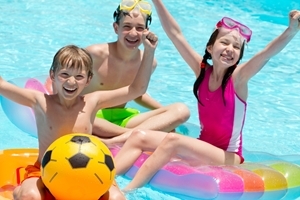 As the summer heat begins to arrive, chances are your children will be excited to hop into the pool with their friends for some aquatic fun. While your kids may know how to swim well already, it's important to keep these three water safety tips in mind throughout the pool season. Even if your little ones seem like champion swimmers who could do laps around the pool for hours, it's essential that a grownup be there to supervise pool activities at all times. There's no telling when an accident or emergency might strike that will require immediate action on your part. Some kids tend to play a little rough, which can be fine during a game of pool basketball or monkey in the middle. However, if you see friendly play start to become overly aggressive, it's vital that you step in and calm things down. One wrong move could result in someone banging his or her head or sucking down a mouthful of water. Children who like to swim underwater to see how long they can hold their breath run the risk of becoming stuck on a pool drain. The powerful force of underwater suction can trap children on the bottom of the pool, so make sure everyone swimming knows where the drains are to avoid them.